The Queen has had the honor of opening the Olympic Games twice, in Montreal in 1976, and again in London in 2012. The outfits and jewels worn on those occasions reflect both the prominence of these events and the special challenges they present. The Montreal Olympic Games of 1976 were a family affair. The Queen, Prince Philip, Prince Charles, Prince Andrew, and Prince Edward all came to support Princess Anne, who was competing with the British equestrian team. 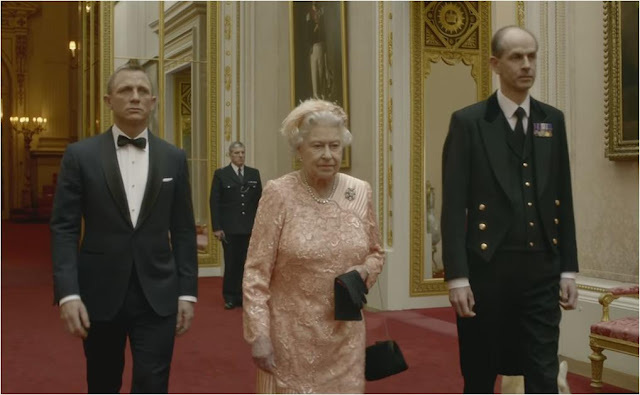 As Queen of Canada, Her Majesty opened the Games wearing a light pink ensemble and a selection of diamonds and pearls. The Teck Corsage Brooch anchored the outfit, but the most special part may have been the necklaces. These look like the historic Queen Anne and Queen Caroline pearl necklaces, which The Queen also wore on her wedding day. (As always, I note how difficult it can be to tell her many strands of pearls apart.) She wore a petite watch, a gift from France, over one glove, as she often did in her earlier years. The pink dress and silk crepe coat were by Hardy Amies, and the scene-stealing pink hat with stylized flowers dangling from silk stems was by Simone Mirman. The outfit would be worn the following year to the Service of Thanksgiving for The Queen's Silver Jubilee, sealing its place as one of the most memorable outfits of The Queen's reign. An Olympic Opening Ceremony outfit needs to hit at least two important requirements, qualities found in that pink Montreal outfit and in the outfit worn decades later in London: it must be easily visible in a crowded stadium, and it must carefully avoid any colors or symbols that could tie it to a specific country. The Queen's dress for the 2012 Opening Ceremony needed to have one additional important quality: it had to easily identify a Bond girl. "The colour of the dress was also fundamental to the success of the sequence. We needed a solid colour that would stand out when The Queen descended towards the giant stadium, and within the setting of the stadium itself, which was a sea of colours. At the same time, care needed to be taken to choose a colour that was not associated strongly with any of the participating Olympic nations. 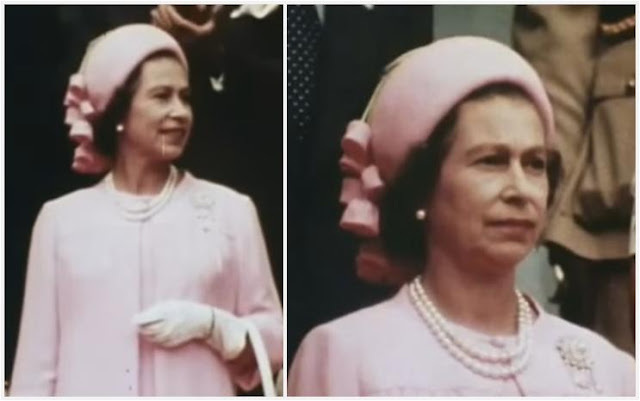 Another important feature of the dress was its pleated skirt, which had to be identifiable as The Queen left the Palace so that it would be recognised as she descended from the helicopter, creating a visual sequence." A headpiece of ostrich feathers with a cluster of small flowers, glass beads, and sequins accompanied the outfit. So did a bunch of diamonds, as The Queen used the evening occasion to dig into the vaults. A smaller diamond collet necklace dipped in and out of her neckline, and Queen Adelaide's Brooch sparkled away from her shoulder. She also wore diamond earrings, which are a bit hard to identify (Queen Mary's Cluster Earrings or Queen Mary's Diamond Collet Earrings, I assume). The 2012 outfit has proven to be one of mixed opinions, as has that hat from 1976. But like them or not, they're both shining examples of how much thought and careful planning goes into The Queen's wardrobe. Both outfits are on display at Buckingham Palace's summer exhibition, Fashioning a Reign: 90 Years of Style from The Queen's Wardrobe, open now through October 2, 2016.